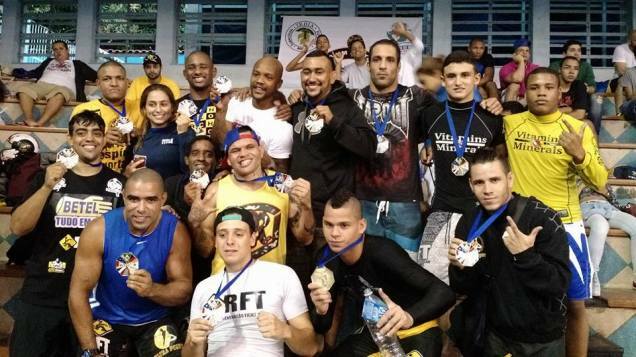 RFT team takes overall second place at the Mundial No Gi. RFT has won an unprecedented title in the martial arts. Under the invitation of CBJJP (Confederação Brasileira de Jiu-Jitsu Profissional), the team sent 23 athletes to compete. It was the first time that RFT participated in the competition under this organization and obtained important medals. Of the 23 registered athletes, 17 gold medals, 4 silver and 1 bronze medals were won resulting in the second place by teams at the World Cup Nogi 2015. The leader of RFT, Mestre Marcio Cromado, showed satisfaction with the achievement. "It's always good to be in competitions and we received with great honor the invitation of the directors. We fought with different rules to our Luta Livre Style in the so called "no gi" events. Nevertheless, it still remains Luta Livre" he said. For Professor Felipe Borges, the RFT reaffirmed its hegemony in the sport. "We are a team formed 14 years ago and have our own training method. Those who doubt are invited to take a roll with us in the gym. They will be welcomed, regardless of style, we like challenges" said the black belt as he was proud of their students performance. Some highlights of the competition were Leonardo Chocolate, who will represent RFT at the world ADCC 2015. He became champion in the black belt category up to 97kg; the black belt Rodrigo Brandao faced tough fights in the category up to 91.5kg and also became champion.